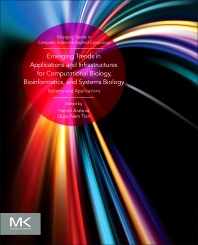 Emerging Trends in Applications and Infrastructures for Computational Biology, Bioinformatics, and Systems Biology: Systems and Applications covers the latest trends in the field with special emphasis on their applications. The first part covers the major areas of computational biology, development and application of data-analytical and theoretical methods, mathematical modeling, and computational simulation techniques for the study of biological and behavioral systems. The second part covers bioinformatics, an interdisciplinary field concerned with methods for storing, retrieving, organizing, and analyzing biological data. The book also explores the software tools used to generate useful biological knowledge. The third part, on systems biology, explores how to obtain, integrate, and analyze complex datasets from multiple experimental sources using interdisciplinary tools and techniques, with the final section focusing on big data and the collection of datasets so large and complex that it becomes difficult to process using conventional database management systems or traditional data processing applications. Hamid R. Arabnia is currently a Full Professor of Computer Science at University of Georgia where he has been since October 1987. His research interests include Parallel and distributed processing techniques and algorithms, interconnection networks, and applications in Computational Science and Computational Intelligence (in particular, in image processing, medical imaging, bioinformatics, and other computational intensive problems). Dr. Arabnia is Editor-in-Chief of The Journal of is Associate Editor of IEEE Transactions on Information Technology in Biomedicine . He has over 300 publications (journals, proceedings, editorship) in his area of research in addition he has edited two titles Emerging Trends in ICT Security (Elsevier 2013), and Advances in Computational Biology (Springer 2012). Professor Quoc-Nam Tran is currently Chair and Full Professor of Computer Science at University of South Dakota. He previously served as Chair and Full Professor of Computer Science at the University of Texas at Tyler. His previous positions include: Professor of Computer Science at Lamar University; Visiting Professor at Rice University; Scientist at Wolfram Research, Champaign-Urbana ; and Assistant Professor at University of Linz (Linz, Austria). Professor Tran's research interests include: computational methods and algorithmic foundations; theory of Groebner bases; bioinformatics and computational biology. He has published extensively in his areas of expertise. He has co-edited a number of books, including: "Software Tools and Algorithms for Biological Systems" (2011) and "Advances in Computational Biology" (2010) (Springer) Professor Tran has served on a number of editorial boards and has organized and chaired sessions for premier conferences such as the IEEE International Conference on Bioinformatics and Biomedicine Workshop.